What’s all this fuss about mud runs and obstacle courses? Is this something you need to get in on? Heck yes it is! Find out why to take the challenge! You just hit a new bench press PR, your body fat percentage hovers in the low single digits, and your 6-pack abs are downright sick. You eat a healthy, low-fat diet, take all the right supplements, and attack your cardio workouts like the animal that you are. But besides a hot bod, what do you get for all that sweat equity? When you return the dumbbells to the rack, step off the Stairmaster, and turn away from the mirror, how do your steely discipline and über-effort translate into the real world? Like a shiny spoiler welded to the rear of a slow-moving sedan, bulging biceps and sinister calves are functionally useless if you can't put them to work outside the gym. That's where training for and competing in obstacle races come in. A wildly popular hybrid sport that's part trail run and part military boot camp (some even feature bellowing drill sergeants), obstacle races are anywhere from 3-to-12 miles long and interspersed with 10-to-30 military-style obstacles and other challenges. Top the whole thing off with a post-race party complete with live bands, food vendors, and alcoholic beverages, and you've got a gleefully raucous combination of mud, sweat and beer. 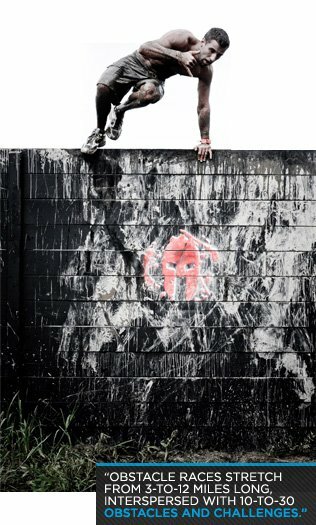 Last year more than a million people put their muscles where their mouths are by competing in obstacle races throughout the United States and Canada - and even across the pond in Great Britain and Europe. Participants pushed themselves to new limits, and they got absolutely filthy in the process. Events like Tough Mudder, Spartan Sprint, and the Warrior Dash have taken the world of endurance sports by storm, in large part because they challenge people in imaginative new ways. At the same time, these races have exposed the weaknesses in many people's bench-press heavy, muscle-bound workouts. Think your indoor, air-conditioned gym workouts can get you through a race? Think again. Doing chest flyes with 25-pound dumbbells is one thing, but carrying a bucket of rocks through deep sand or shoe-sucking mud and up and down steep hills in Spartan's Bucket Brigade is a totally different animal. Your ability to do pull-ups on a clean, dry bar in the comfort of your own basement gym tells you little about your chances of swinging your way across the mud- or grease-slicked monkey bars featured in many races. Like those nifty BOSU balancing exercises you do? Try 'em on the Civilian Military Combine's Balance Beam River Crossing, a wobbling timber spanning bone-chilling water. Still not convinced that you need to do some specialized training? Dart through Tough Mudder's Electroshock Therapy - a thicket of dangling wires charged with up to 10,000 volts of electricity - and then let's talk. The military trainers who invented obstacle courses knew that a soldier's ability to perform rote exercises in a controlled environment revealed little about his mettle: that elusive quality of character and spirit that comes out when faced with real challenges, stress, and, of course, fatigue. They wanted to test their recruits under fire. That's why they invented obstacle courses complete with cargo net climbs, scaling walls, and low crawls through mud pits strung with barbed wire. And that's also why entrepreneurs like Joe Desena of Spartan, Dean DelPrete of The Survival Race, and Sophie Pollitt-Cohen of the GORUCK Challenge borrowed the concept for a whole new breed of races: because regular old workouts and races just weren't challenging enough anymore. The immense popularity of these races is growing, but it's a tough band-wagon to jump on. It's fast-moving, muddy and full of ridiculously difficult challenges. But once you're on, it's almost impossible to get back off. 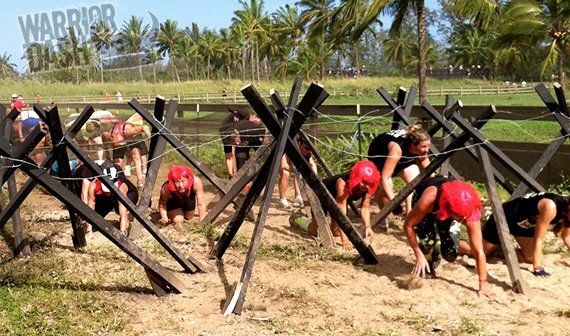 Put your gym-crafted body to the test: try an obstacle race this summer!